Modules now include validation, editor options, and display conditions as well as repeating and grouping functionality. In this section we’ll take a look at each of these. Use a regular expression to validate a field. Below is an example of a simple email validation expression and the resulting editor experience. Make this field required: User will not be able to leave this field blank. Prevent editing in content editors: Allows you to have content that is hidden and uneditable by end users. Note that this content is available at the template level. This can be a helpful feature for designing modules that can be tweaked from template to template instead of creating multiple modules with subtle differences. Help text: Add helper text to give users context or instruction. Below is an example of Help text in the inspector and how it appears in the editor. You may wish to display a field to a user only if another field meets certain criteria. The Display conditions section allows you to set these conditions. 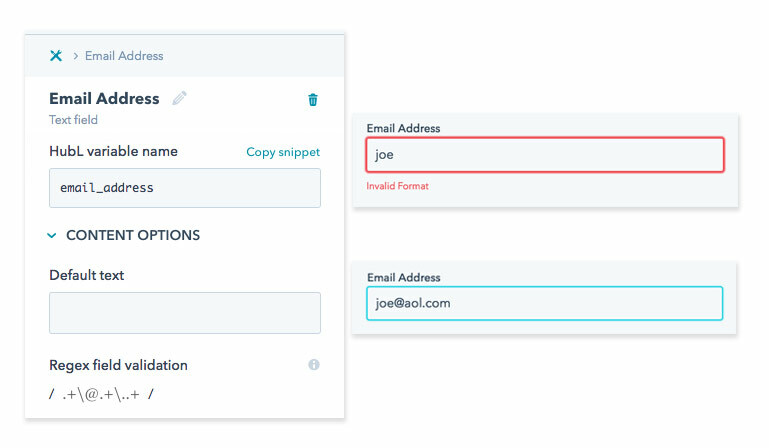 In the example below, the Email Address field will only appear to users if they have already filled out the Full Name field.